Today I want to show you a very special place. I want to take you by the hand, lift the curtain and step back quietly just as you lay eyes on the spectacular space in front of us. 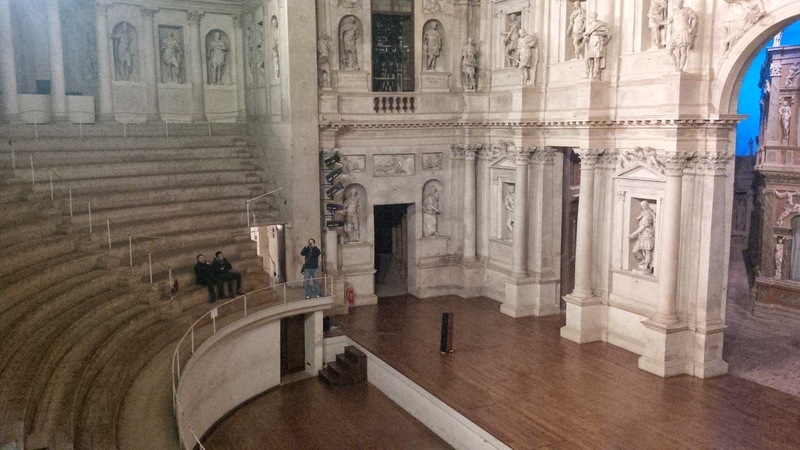 This is Teatro Olimpico in Vicenza. A theatre built 430 years ago which still amazes us today with its sumptuous stage, elliptical auditorium and abundant sculptures. The most extraordinary thing about it though are the ‘perspective views’ – a stunning set of seven street views which are visible beyond the stage doors. Every time I see them, I am filled with awe. It’s like a whole city is nestled there at daybreak, waiting to wake up and come to life. Teatro Olimpico was built between 1580 and 1585. 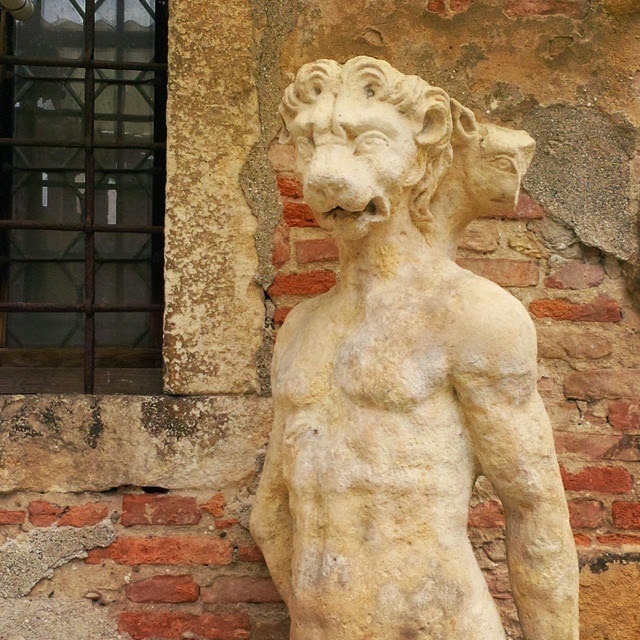 It was the last project of Andrea Palladio – the Renaissance architect who defined Vicenza’s character. 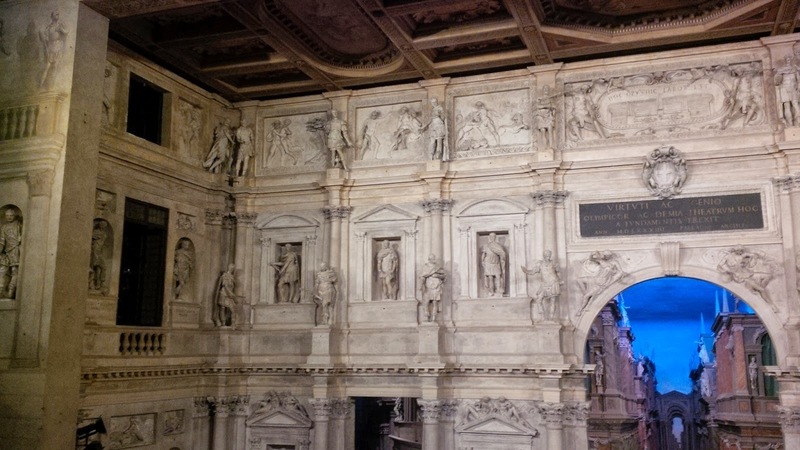 The construction of the theatre was commissioned by the Accademia Olimpica – a cultural institution founded in 1555 by a group of the city’s intellectuals. 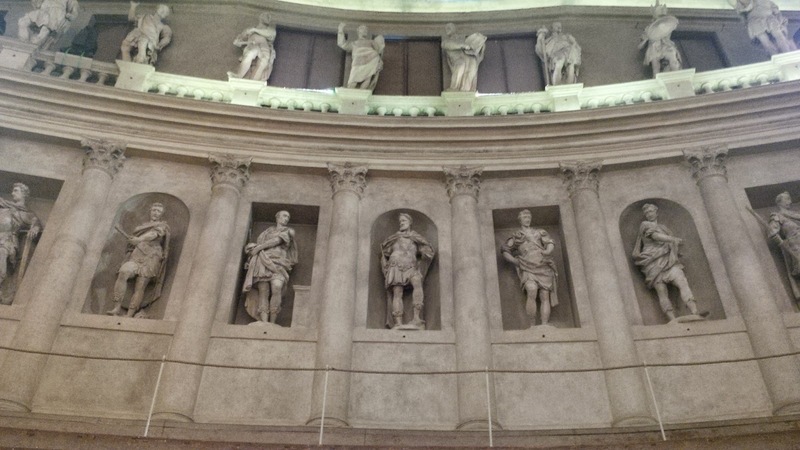 Palladio himself was a founding member. 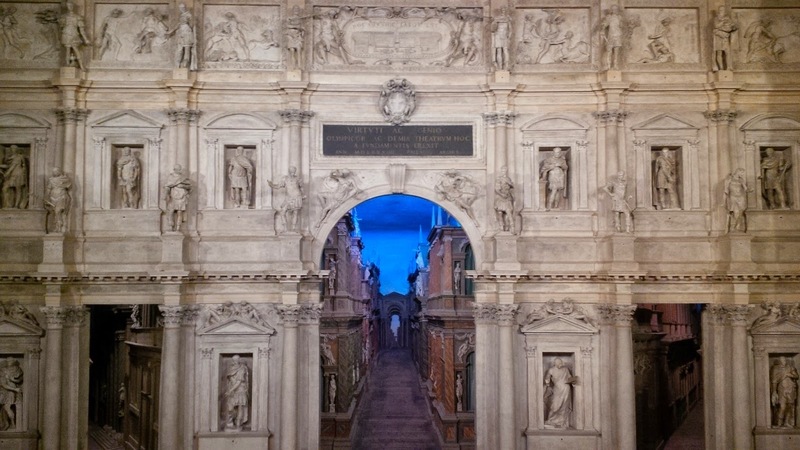 Unfortunately, he died six months after construction began and so another renowned architect – Vincenzo Scamozzi – completed the project. The building in which the theatre was erected was previously a fortress, then a prison and eventually a gunpowder warehouse. 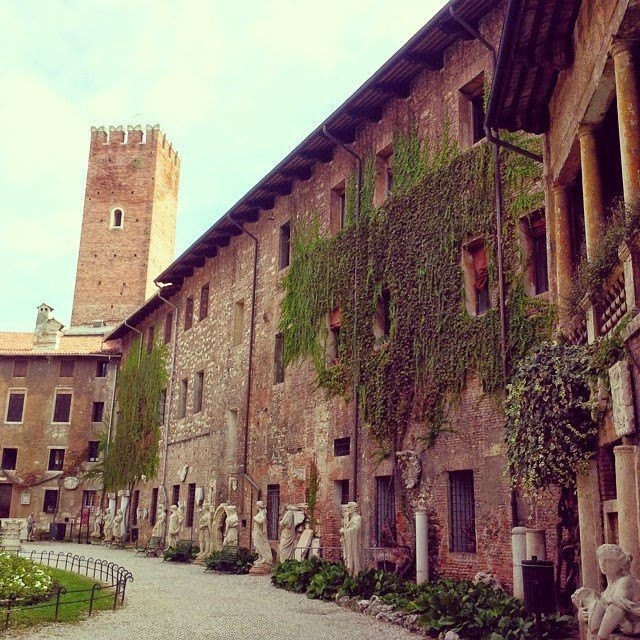 It stands at the bottom of Corso Palladio – modern Vicenza’s elegant high street, and it is just opposite Palazzo Chiericati. 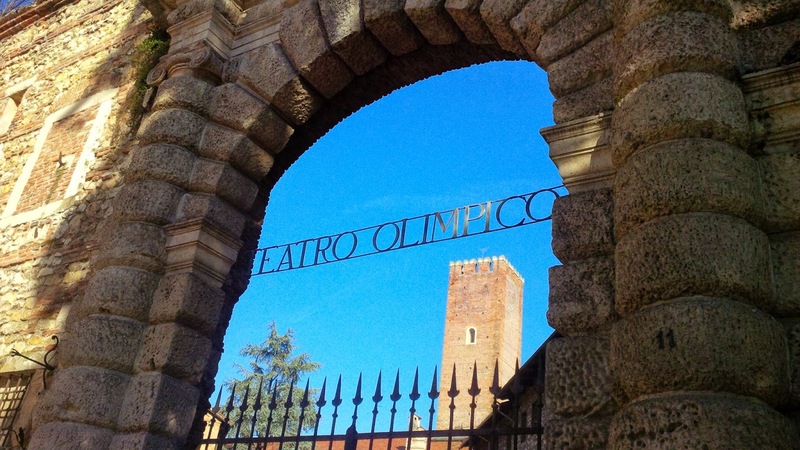 A metal sign spelling ‘Teatro Olimpico‘ is embraced by the mighty arch of the thick stone walls that surround the theatre. Step over the figurative threshold and you will find yourself in a quiet green oasis. The gravel path crunches underneath your steps. The lush ivy covering the walls provides some moisture and respite from the sun even on the hottest day. Statues, pillars and stone ornaments line the path and guide you forward. 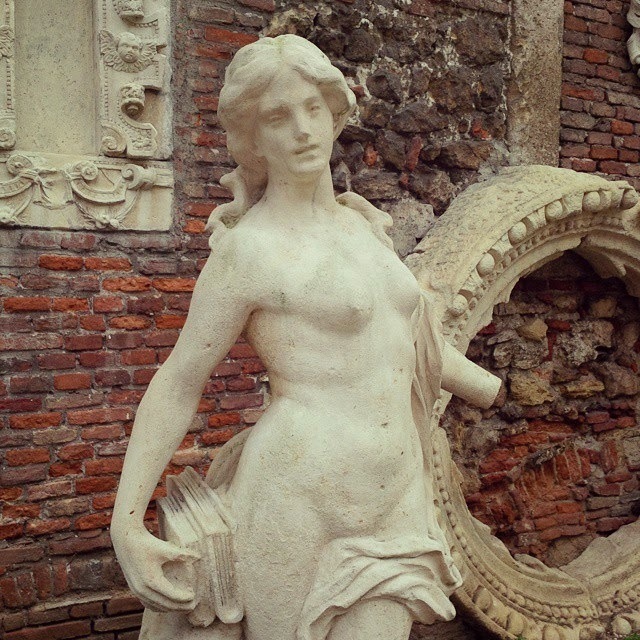 When we moved to Vicenza in August 2014, I would often go to Teatro Olimpico’s courtyard to look at the statues and just have one of those ‘pinch me’ moments of ‘OMG, I live in Italy now!’. No, these are not their official names, just the monikers I gave them. Today, though, we pass quickly through the courtyard and go inside, looking for the pearl that this slightly odd and angular architectural shell encompasses – the theatrical auditorium itself. Beyond the door and with ticket in hand we head down a corridor on the left to find ourselves in a large antechamber richly painted in such a way so as to appear covered in statues and marble. 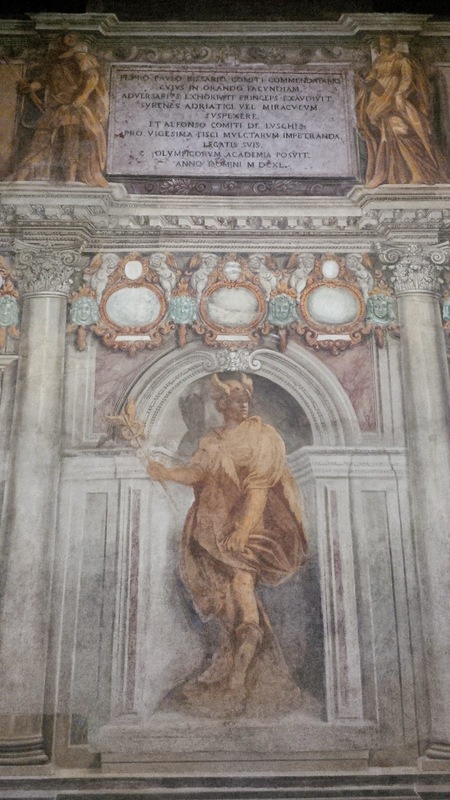 Then, we need to go down some steps and we find ourselves in a dimly lit cold corridor where we can spend some time reading the large panels with information about Teatro Olimpico, its story and its inaugural performance of Sophocles’ Oedipus Rex in 1585. Apparently this was quite the event of its day with 3000 spectators eagerly waiting for nine hours for the performance to start. Nine actors and 80 extras brought the classical Greek tragedy to life with sumptuous costumes and carefully orchestrated movements on stage. From the dim corridor, we go up some more steps and then, to the left, a humble door awaits. Step through it and I dare you not to exclaim in amazement when you come face to face with this. The perspective views of houses, arches and streets seem to stretch all the way to the horizon. In fact they are only 12 meters deep. 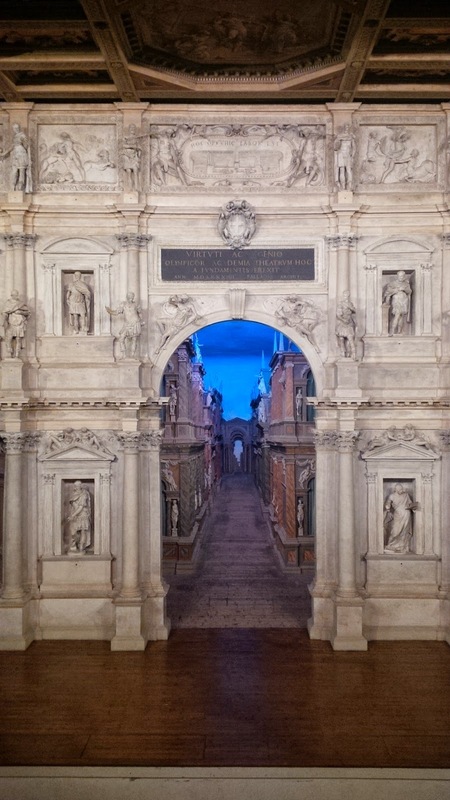 Created by the architect Scamozzi to represent an idealised vision of the city of Thebes for the inaugural performance in 1585, they were never taken down and are the world’s oldest surviving stage set still in use today. 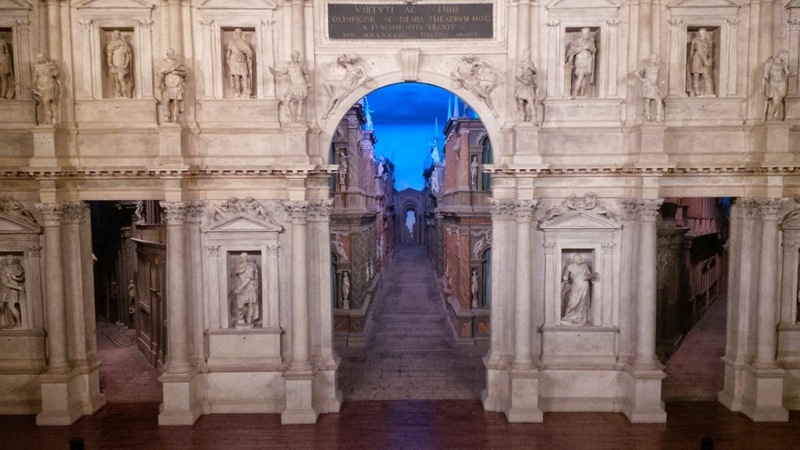 This is quite amazing, considering the heavy bombings Vicenza endured during World War II. Every inch of the stage and the auditorium are covered with sculptures and sculptural ornamentation. A blue light emanates from the perspective views beyond the stage. It’s like you are in a mausoleum where instead of Death we celebrate the Performing Arts. 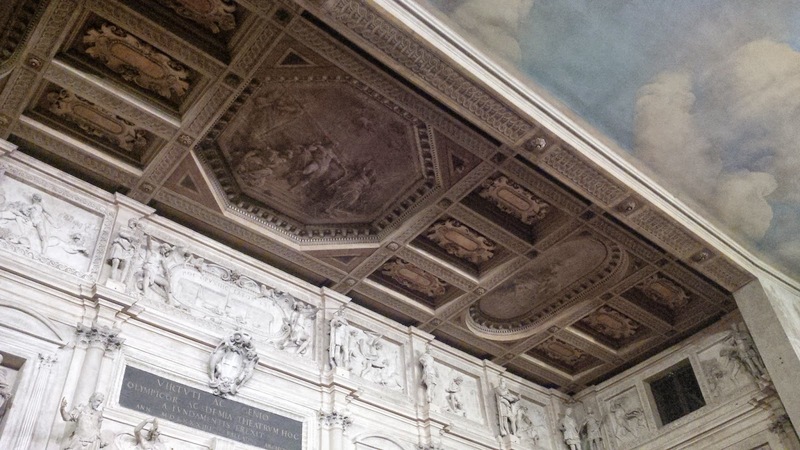 and the ceiling which is fabulously decorated above the stage, whereas above the seating area is painted to look like the blue Italian sky. It is all so awe-inspiring, it comes as a huge surprise to be told that it is all made of plaster, stucco and gesso. Yes, it takes a few seconds to sink in that nothing in this majestic space is actually made of marble. 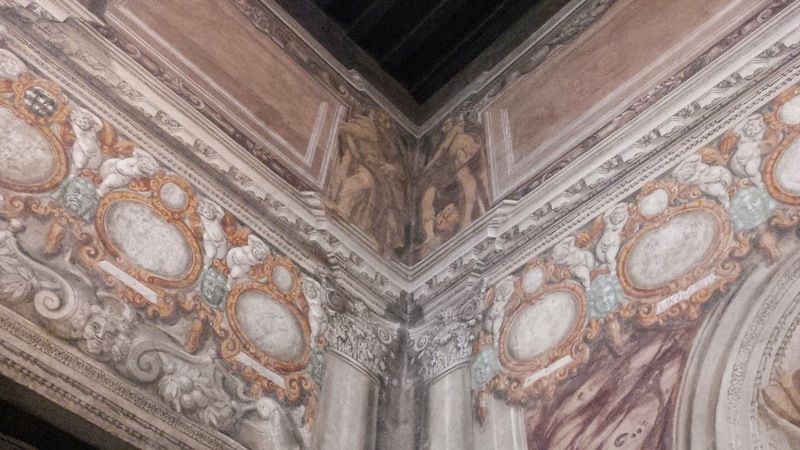 Unless you count the marble powder which was used to cover the surfaces to make them look like the real thing. It is quite befitting in fact, as this is a theatre – a place where we go to experience life as a performance – with a clear start and end and, if the playwright was good, then also with a moral to take away with us. In a theatrical performance everything is made to look real, but it’s not. 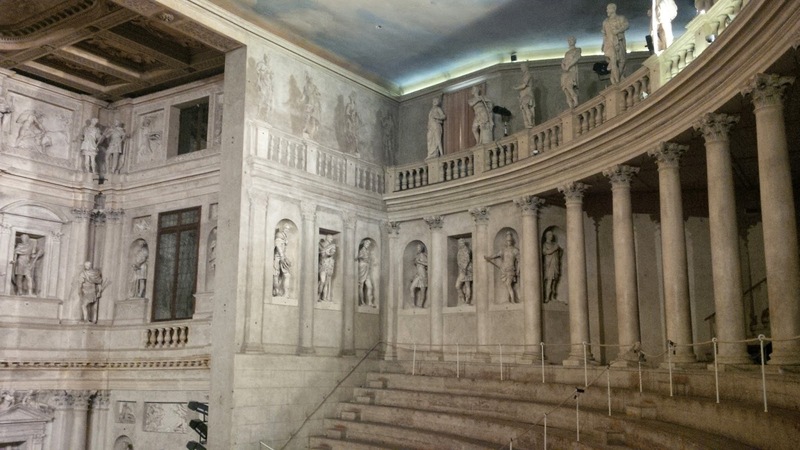 As such, I found the sophisticated, but still butaphoric surroundings of Teatro Olimpico quite appropriate. The illusion they create is so real though, somehow the real world outside looked lacklustre and unappealing after that.